Anyone suffering from serious illness should ask for Anointing of the Sick. 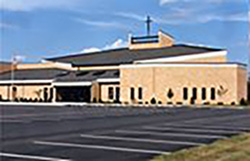 Parishioners may call the parish office, 317-257-4297, extension 2100, to request this sacrament. The most common time for Baptism is during infancy. When parents bring their child forward for infant Baptism, they along with their godparents commit to passing on their faith in Christ to the child. The grace that flows through the sacrament is strengthened through a faithful family and active participation in the Christian community. To schedule a Baptism for your child, please contact Jeni Lengerich Pleiss, Director of Faith Formation, at 317-257-4297, extension 2215. Baptisms should be scheduled at least three months in advance of the proposed date and typically do not occur during Lent, except for life-threatening emergencies. Requirements: (1) Parents of baptized children must be registered in the parish. (2) If you are scheduling a baptism for your first child, there is a required Baptism preparation class that must be attended before your child’s Baptism. (3) At least one parent and one godparent must be Catholic. (4) You must complete the Baptismal Information Form and Godparent/Sponsor Form. After a child has obtained the use of reason (about age 7), he or she becomes more responsible for making the Baptismal promises. Because the child has gained the use of reason, it is no longer just the parents and godparents who are asked to help nurture God’s gift of faith in the child. The child must display a desire to receive the sacrament and have an age-appropriate understanding of the sacrament. Therefore, when children come forward to be baptized at this age, there will be a period of preparation that varies by the age of the child. For more information, please contact Jeni Lengerich Pleiss, 317-257-4297, extension 2215. When adults come forward to be baptized, they are prepared to receive all three Sacraments of Initiation: Baptism, First Eucharist, and Confirmation. This occurs in the context of a class and series of rites called the RCIA program or Rite of Christian Initiation of Adults. Please contact Jeni Lengerich Pleiss, 317-257-4297, extension 2215. Confirmation is a mature Christian commitment and a deepening of baptismal gifts. Like Baptism and Eucharist, it is a Sacrament of Initiation for Catholics and a sacrament of faith in God’s fidelity to us. Students who have reached the 10th grade are invited to our Confirmation program. The Confirmation program is administered annually at the parish level by the Youth Ministry Office. Preparation for youth includes participating in a retreat; making public commitment (Rite of Enrollment); attending large group learning sessions; meeting, studying, and praying regularly with his/her sponsor; completing assignments; performing community service; receiving the Sacrament of Reconciliation; and attending Sunday Mass. Youth and families who would like more information about Confirmation may contact Cari Weibel at 317-257-4297, extension 2210. Each year at the Cathedral, the Archbishop holds Confirmation for adults who have been baptized and have received some religious education but have not, for whatever reason, been confirmed. Each year, the North Deanery parishes sponsor a retreat for individuals who are going to be confirmed. If you are a baptized adult who would like to be confirmed, please contact Jeni Lengerich Pleiss, 317-257-4297, extension 2215. Catholics believe the Eucharist, or Communion, is both a sacrifice and a meal. We believe in the real presence of Jesus, who died for our sins. As we receive Christ’s Body and Blood, we also are nourished spiritually and brought closer to God. Preparation for First Holy Communion takes place each spring for children in second grade and older. For Catholics: As Catholics, we fully participate in the celebration of the Eucharist when we receive Holy Communion. We are encouraged to receive Communion devoutly and frequently. To be properly disposed to receive Communion, participants should not be conscious of grave sin and normally should have fasted for one hour. A person who is conscious of grave sin is not to receive the Body and Blood of the Lord without prior sacramental confession except for a grave reason where there is no opportunity for confession. In this case, the person is to be mindful of the obligation to make an act of perfect contrition, including the intention of confessing as soon as possible. (Code of Canon Law, canon 916). A frequent reception of the Sacrament of Penance is encouraged. For Non-Christians: We welcome to our celebration those who do not share our faith in Jesus Christ. While we cannot admit them to Holy Communion, we ask them to offer prayers for the peace and the unity of the human family. Copyright © 1996, United States Conference of Catholic Bishops. All rights reserved. To be married at Saint Matthew, at least one spouse must be a registered parishioner. Couples must enter the wedding preparation program at least 6 months before anticipated date for the wedding. Please note–you cannot enter into the marriage preparation program unless you have been registered in the parish for at least 6 months. Contact Jeni Lengerich Pleiss, 317-257-4297, extension 2215. The Sacrament of Penance (also known as the Sacrament of Reconciliation or Confession) has three elements: conversion, confession, and celebration. In it we find God’s unconditional forgiveness, and as a result we are called to forgive others. In preparation for Penance, you should do an examination of conscience. Reconciliation usually is offered every Saturday at 4-4:30 p.m. in the church. Reconciliation can also be received by scheduling an appointment with the priest by calling 317-257-4297, extension 2100. North Deanery Penance Services are celebrated during Advent and Lent. Children of Saint Matthew Parish are prepared for the Sacrament of Reconciliation during second grade.